Mickey Harte was in Belfast on Wednesday night to watch Lee Brennan’s scoring display against holders St Mary’s. THE TYRONE TEAM to face Dublin on Saturday night has been named, with Mickey Harte’s side showing five changes from their defeat to Galway last weekend. Omagh defender Ciaran McLaughlin makes his first league start for Tyrone in his hometown, while Cathal McCarron also comes into the full-back line. Declan McLure, Richard Donnelly and Lee Brennan – who scored 0-6 for UUJ in a midweek Sigerson Cup game – also start. Harte was in Belfast on Wednesday night to catch Brennan’s fine performance against holders St Mary’s and he’s been rewarded with his first league start for the county. Brennan only featured briefly in last year’s league but is regarded as one of the most promising young forwards in the county. In total Tyrone start with eight players who began the 12-point All-Ireland semi-final defeat to Dublin last August. Email “After scoring 0-6 in Sigerson action, UUJ forward makes first Tyrone start against Dublin”. 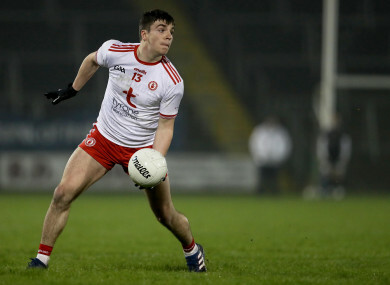 Feedback on “After scoring 0-6 in Sigerson action, UUJ forward makes first Tyrone start against Dublin”.